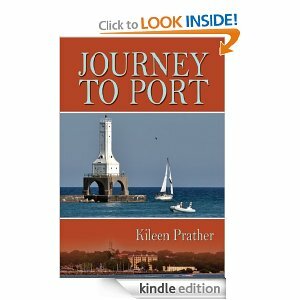 Novelist Kileen Prather’s second book Journey To Port, takes place in Port Washington and Door County, Wisconsin and Ludington, Michigan. Born in Wisconsin, she spends summers and fall in Port Washington when she is not out directing tours. She is a graduate of the University of WI-Madison with a B.A. in history and has an M.A. in Library Science from Central Michigan University. Journey to Porttargets the baby boom generation and is the story of a recently divorced 50 + woman who reinvents her life while trying to solve a 150 year old family mystery. Her stories take place in various locales in the United States since mature adults love to travel and dream of places to visit. Her characters are ordinary people struggling with issues aging adults face such as changing spousal relationships, parental concerns, and illnesses. “Being told there is very little romance in the lives of today’s boomers, and even if romance exists, no one wants to read about it, is what spurred me to write about that exact subject,” Prather said. Journey to Port is available through the author on her website ( www.kileenprather.com ) or Amazon.com. As an aside from the author: The books are $15.95 but if they send me their address with a check, I will sell the book for $14.00 autographed or they can take both “Journey To Port” & “Journey Beckons” for a one time price of $27.00 & that would include shipping on either deal. This entry was posted in Journey to Port, Kileen Prather. Bookmark the permalink.